So, I decided to skip this month's Fabletics outfit for no reason other than nothing really "grabbed" me this month, and let's be real; I can stand to skip a month or two because I have a lot of workout clothes!!! However, just because I skip my outfit doesn't mean I want to skip my monthly reflection on all things Pilates this month, so let's get started! As you can see, the biggest update is that I GOT MY REFORMER! It is fabulous! It really is such a convenience to be able to go down in the basement and fit in a workout whenever my schedule allows. Even though I've only had it for a couple of weeks, I can still feel the relief knowing that this allows more flexibility in my schedule. I definitely still plan to teach at the studio because I definitely think there are advantages to having access to the studio equipment, but being able to squeeze in more teaching hours whenever possible is a nice perk. I do want to get a curtain for that back wall (i.e. I hate that electrical panel), and I also want to buy a wall full of mirrors, but otherwise, the reformer itself is pretty amazing and fits into the space perfectly! March and April have proven to be a challenge from a schedule standpoint. I've been traveling a bit more for work, just coincidentally. Work travel comes and goes in waves, and this first quarter just happened to be a busy one. That being said, I'm falling behind in my observation and teaching hours, which is giving me anxiety. I am glad I finished the lectures when I did because if I had to worry about the lectures right now, too, I'd be hopelessly behind. I've been ok keeping up with my own personal workouts and my lessons with a former graduate, but observation and teaching has been a challenge to keep up with. Especially teaching. You wouldn't believe how hard it is to find people to teach classes to FOR FREE! And everyone's schedules are busy at the moment, so even if I do have all 4 hours of teaching scheduled for the week, chances are someone will need to cancel. I can't blame them because life happens! But it's a challenge staying ahead. 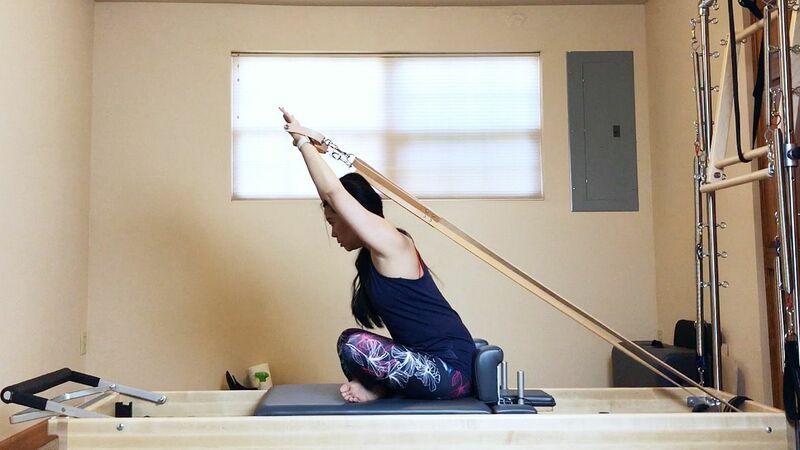 I do have the opportunity to teach more group classes at the studio though, so I'm hoping that + now having my own reformer will help me get caught up on my teaching hours. If I don't finish the program on time, I will have to pay to extend my time, which isn't the end of the world, but I just want to finish as close to schedule as possible! I've been trying to interject more Pilates posts on my personal Facebook page as well as my Instagram (which is mainly a blog account.) I'm sure that turns some people off, but it's such a big part of my everyday life that it's hard to not post about it. 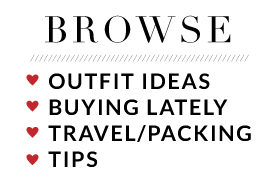 Plus, I like spreading awareness and interest about Pilates. I've found that most people know absolutely nothing about Pilates, so it's nice to just plant the seed and pique people's interests. I've never ever been this passionate about any other type of physical activity. Ever. It just feels good to do something that I love and see results not only in myself but in the people I teach. It's very gratifying! As far as other big milestones since my last update, I posted about my first group class in a previous post here if you missed it. The "new" thing that I've been working on is lengthening my sternum. I feel like my upper body is very congested and I'd like to lengthen it, focusing on the upward energy through my sternum up through the top of my spine vs. the energy that I usual focus on tucking and inadvertently lengthening my lower spine. I'm sure that sounds like a super weird goal, but that's kind of what Pilates does - it brings light to certain imbalances and bad habits you've developed in your body. 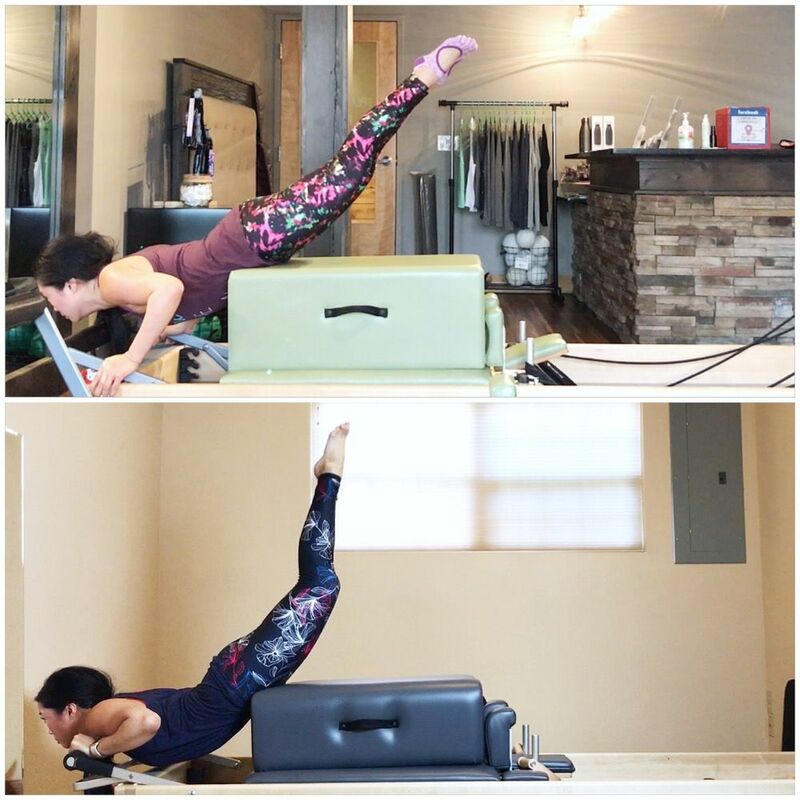 Because I like sharing progress photos, I thought I would share these side by side photos of me doing "grasshopper" on the reformer. 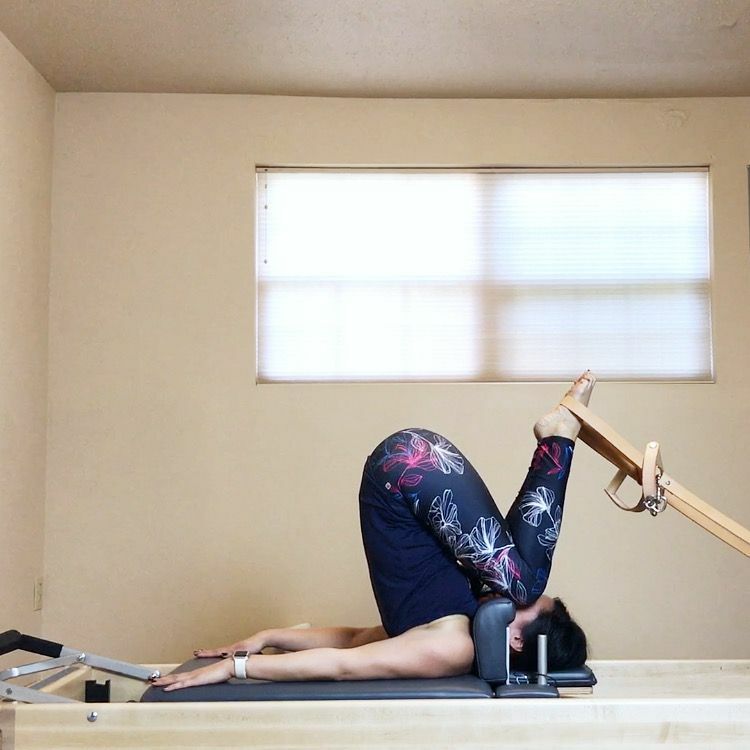 Obviously I'm holding the reformer in different places in the two photos as I'm still trying to figure out which placement I prefer. What I'm looking at in particular is that I have more trust in the equipment. 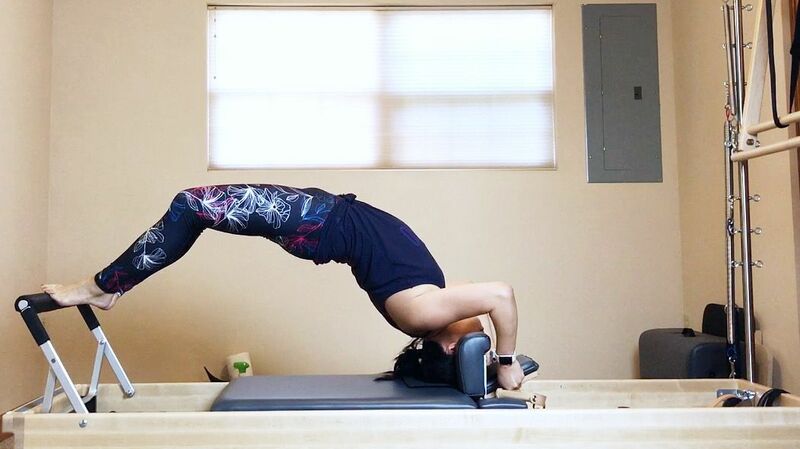 I was able to get my hip bones closer to the corner of the box, which helps give me more range and articulation in my spine and better leverage to lift my legs more upright. The next step to this exercise that you're not seeing in these photos is to bend my knees bringing my heels towards my head. 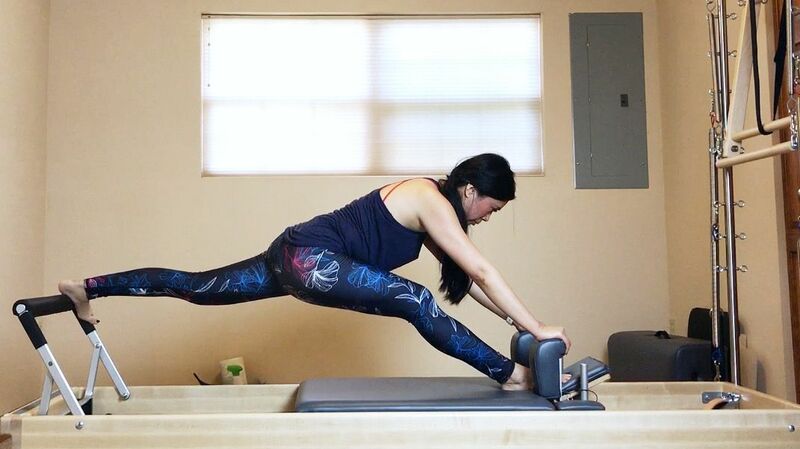 I love this exercise because it challenges my upper body strength, continues to work on my spinal extension, stretches the front of my hip, and turns on my hammies! All good things! That's all I have for you for this month's update! I really love putting these posts together because even if I'm falling just a little bit behind, this helps remind me that progress is still progress! Wow, your progress in that last comparison photo is very impressive! 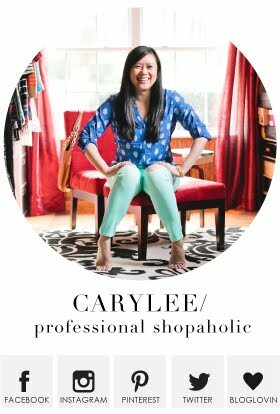 And it does sound very stressful to try to get all those teaching and observation hours in on top of your full time job, travel, and blog schedule!! (And baseball! LOL!) It will be worth it when you become an official instructor, though! Great progress you got here! And I love your workout gear!